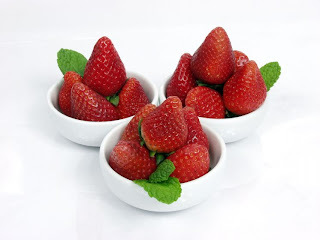 Winning Startups: Strawberries to die for! I went to a restaurant in the San Diego area a while back and on their menu was corn from Chino Farms. How odd to advertise where they got the corn from, I thought. So I asked the waiter what Chino farms is. Apparently it’s been on the Food Network and they are the supplier of fruits and vegetables for many restaurants around SoCal. Additionally, students come from around the globe to learn this family’s farming techniques. Since I grew up on a farm, I was very intrigued to see what was so special about Chino farms. So I drove up to Rancho Santa Fe and went through the dirt roads to find this little vegetable stand in the middle of nowhere. All their produce is fresh picked in the morning and they stay open until they are sold out for the day. And they do sell out everyday. No prices on any of the food, of course. I had to get the corn on the cob, that’s what I drove out there for. I only wanted two ears, but had to buy at least 6 (their rule). They were a dollar apiece! My dad would have a heart attack if he knew I spent that much on their corn. The clerk sold me on some strawberries too. For a tiny supply of French strawberries I think we paid ten bucks or something crazy. Turns out it was the best ten bucks ever spent. They were the best strawberries you can imagine. Melted in my mouth. My daughter threw one on the floor and I picked it up and ate it. Can’t waste any of those!